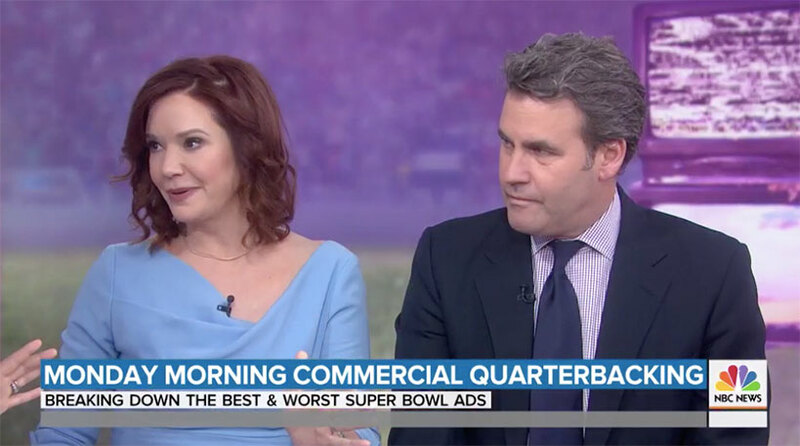 Looking back on my previous TODAY Show appearances, here's a quick stroll down memory lane, with my 2014 tips from the most fascinating Super Bowl commercials. The same principles that make a Super Bowl commercial fascinating will work for your own communication. This is true for ANY type of communication — whether it’s an introduction, a bio, or a first date. Watching ads at a Super Bowl party is totally different than regular TV. A commercial has to hook people instantly, or we’re off to the kitchen for more chips. Your communication is the same way. Hook people with a message that’s entertaining, informative, or surprising… or they’re off. 1. Simple storytelling: Super Bowl parties tend to be noisy and distracting-- not to mention “well-lubricated.” With this kind of backdrop, the best spots tend to be no-brainers that don’t ask people to think too much. 2. Surprise your audience: Whether it’s humor or shock value, when we’re watching the Super Bowl, our attention spans are shorter than ever. Special effects and huge production extravaganzas dazzle viewers even when the TV sound is turned off. People can’t help but notice something unexpected. 3. Tell a story: When commercials tap into a basic human truth, they don’t just entertain – they make us feel something. They get under our skin and into our conversations. They show us who we are. 4. Make it relatable: Every year, the Super Bowl is brimming with commercials starring animals and babies. That’s because we can’t help but feel an emotional connection with pure cuteness. This year, the Super Bowl will have more animals than Noah’s Ark. We’ll see dogs, puppies, bears, horses, and more puppies. Even a few Muppets. 5. Familiar icons: Neurology shows that we’re more likely to respond to images that are familiar and comforting. During the Super Bowl, or any cluttered environment, familiarity can win out over the more “edgy” ideas, because we already have an association with the image or person. For example, it’s almost impossible to talk about classic Super Bowl advertising and not mention Clydesdales, right? 6. Controversy: When you need to immediately break through and make a statement, it can be worth taking a risk of using shock value or an unfamiliar storyline. (Anyone else remember years ago when Outpost.com shot a gerbil out of a cannon?) Provocative spots definitely get people talking, which add up to media dollars. What commercials are YOU most excited to watch? Which ones are most fascinating in those critical first 9 seconds of an introduction? Which ones lost your attention? Do tell, in the comments section below. Loved the BudLight ones... they each told a part of the story. And... what? who knew that the others had corn syrup? Or that that was even a thing!?!? Huh.